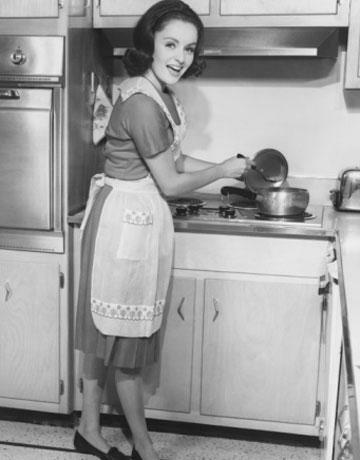 ...is there any more universal memory maker than the smell of mom cooking in the kitchen? This week Let's Blog Off asks: What smell takes you back? Well it's no coincidence our minds first go to food! Though not official foodies, the AK Team does appreciate a good meal. Gatherings with friends for us means getting together to cook, drink and eat; it's a full participation event! This present day interest in cooking - and kitchens - has roots in the smell that takes us back. Remember your favorite meal as a kid? Remember your mom (or dad, or grandma) preparing it? Even when it was just a run of the mill Monday or Thursday night - the comfort of the surroundings, the radio playing softly in the background with the familiar clangs and pings of the spoons on the pots - and the smell that would waft over to where you sat working on your homework, or practicing piano. Those are the smells that take us back. What better place to go then back to the comforts of childhood? When, if you were lucky like many of us, your biggest worry was your math homework, next weeks book report or the Lima beans you were about to be served! When a family dinner was as reliable as the sun rising and meals were cooked with love - and only minimal microwaving. Is it any wonder that we ended up doing what we do for a living? With such happy memory triggers surrounding the kitchen it's no surprise we love creating them for others on a daily basis. It's a cliche, but the kitchen really truly is the heart of the home! Before we design a kitchen we always talk with the homeowner about how they use their kitchen: how they grocery shop, where the kids do their homework or use the computer, how they entertain, how many they host. Think of the lifetime of happy memories that need to be incorporated into each design! When we make spaghetti sauce or split pea soup, we use the crock pot because you can simmer them for hours and never scorch them. The cool part of it, though, is that it fills the whole house with those wonderful aromas! Ah two out of the three faves are Italian and I whole heartily agree. Now turkey, that's a different story. @Joe, @Todd & @Bridget - Thanks so much for taking the time to leave us with a response. Writing this yesterday definitely made us hungry! Yes, I'm sure you're right about the connection between memories of the smell of home cooking and our interest in cookery.